Offering comprehensive auto repair services in Gulf Shores, AL, GSBP Automotive is here to help you have full confidence in your car. For nearly 30 years, this crew of expert mechanics has provided car maintenance and repairs for all makes and models, foreign and domestic. While their service is the best in the area, you’ll find added relief in knowing that their rates are also some of the lowest. GSBP Automotive has an exceptional track record of tackling some of the most challenging auto repairs. When you’re unsure of what’s complicating your car, their team of ASE-certified technicians will quickly diagnose and fix problems affecting any system—including car brakes, transmission, and shocks. They are also recognized for their expert engine overhaul services if your vehicle has reached its maximum mileage. Beyond major car repair, this Gulf Shores auto shop will provide all the routine car maintenance you need to keep your vehicle’s safety and performance on point. For example, they provide fast and inexpensive oil changes and will install new tires. Apart from being ASE-certified, the GSBP Automotive crew takes pride in holding factory certifications for many common makes and models. With such in-depth expertise, they are able to troubleshoot problems quickly and provide you with invaluable insight as well as free, accurate estimates. They are also backed by the latest tools in the industry, including computerized diagnostics, alignment, and balancing systems. With a 7,000-square-foot facility, this well-staffed shop has the resources to provide auto repair with a fast turnaround time. 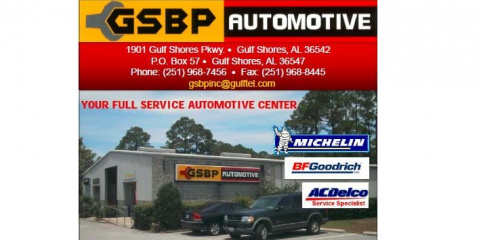 Visit GSBP Automotive online to learn more about their available auto services in Gulf Shores, AL. If you have questions about auto repair or want to schedule an appointment, call a trusted technician today at (251) 968-7456.